The Oxymax-ER is an ideal instrument for measuring the respiration rates of animals, insects, soil, compost, sludge or waste water. 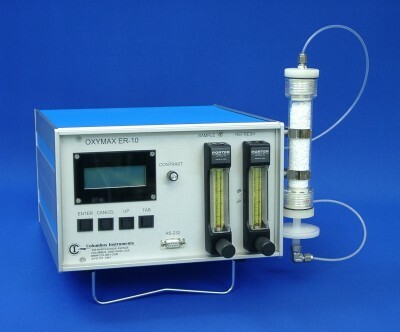 The Oxymax-ER is an inexpensive single or dual gas (O2 / CO2) respirometer. The ER-10’s dimensions (36 cm x 29 cm x 19 cm) and weight (9 kg) make it convenient to use both in lab and field situations for measuring a range of physiological and biogeochemical samples. The Oxymax-ER can simultaneously measure 1 to 10 liquid or solid samples, from 50 ml to 10 liter in volume. The patented principle of measurement, which involves air sampling from the head space of the sample chamber, circulating it through the gas analyzer and returning back to the sample chamber without any contact with the sample, assures that the gas analyzer cannot be easily contaminated. The calibration of the O2 gas analyzer is done automatically and periodically with ambient air, removing the need for expensive, precisely-mixed gas bottles while respirometers equipped with the CO2 analyzer only need to be calibrated once a year. Results of measurements are presented in mg O2/hour or as an accumulated (total in mg) value of oxygen consumed from the beginning of the experiment. Samples are continuously aerated with adjustable air flow (100 ml/min. to 1,500 ml/min.) except for the short time interval when a particular sample is being measured by the gas analyzer. For solid samples (moist soil or compost) which are prone to water loss, an optional condensing air dryer is available. Water vapor is returned to each chamber as water droplets, restoring the sample’s moisture content. The Oxymax-ER Respirometer allows either fixed or variable measuring intervals. Fixed intervals may be user set from 3 to 30 minutes. Variable measuring intervals are set by Oxymax-ER based on the activity of the sample. In variable mode, the operator sets a gas concentration threshold that, when exceeded, triggers a measurement and a new measuring interval. Provision of the two modes allows Oxymax-ER to have both the high sensitivity (0.05 mg O2/hour) required for very low-level measurements while also supporting the special measurement needs of activated sludge and compost research. 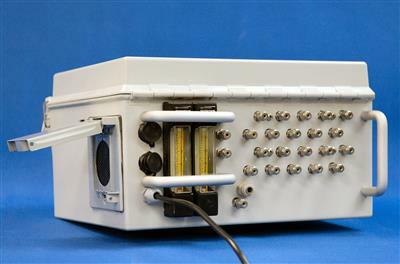 The Oxymax-ER Respirometer has its own microprocessor and can operate without a computer and send the data to a desktop or laptop computer via an RS-232 interface. Software for the PC allows transfer of ASCII files to a spreadsheet for real-time graphical and numerical data presentation.